You can reach us anytime during regular business hours. Call Gaines Customer Service at 858-486-7100, or email us here. 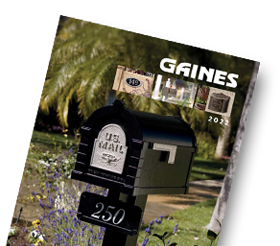 If you are looking for a retail store that sells Gaines products near you, click here. You may download our Product Catalog here. Keep in touch! Subscribe to our free eNewsletter. We also have pages on Facebook and Twitter.